Last week, I said the UB-Toledo game was one of the biggest in school history. This week, the Bulls are facing their biggest game of the year. 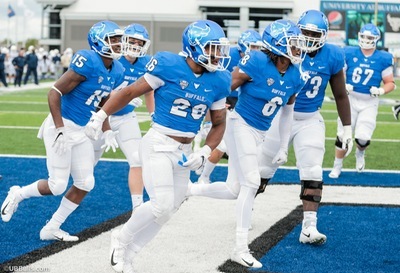 The win at Toledo was a major statement for the UB program. They’re just the second MAC East team to win at Toledo in the last 8 years. The way they won, coming back from 10 points down at halftime, was just another example of the confidence, resiliency and attitude of the 2018 Bulls. They’ll need all of that Tuesday because of what’s at stake. Even with a 7-1 overall record, the Bulls are just one game ahead of Miami in the MAC East. The Redhawks are 3-1, the Bulls 4-0 in conference play. A UB win gives them a huge edge on MU, and keeps UB a game up on Ohio. A Redhawks win not only puts them in a tie for first, but gives them the tiebreaker. Throw in the first midweek MACtion and a national TV audience, and this is the latest “biggest” game for the Bulls. To everyone except the players and Head Coach Lance Leipold. Bull Session Trivia: Miami calls itself the “Cradle of Coaches” due the many famous names that started their careers in Oxford. Woody Hayes, Bo Schembechler, Ara Parseghian, Paul Brown, Jim Tressel and Weeb Ewbank all coached there. Two current NFL head coaches are also Miami alums. Can you name them? After catching his first touchdown against Toledo, and first in four games, Anthony Johnson ran to the TV cameras and yelled “I’m back.” He certainly was. Johnson’s hamstring injury has healed, and he showed it with four catches. His 32 yard run-and-catch, cross-the-field-and-weave-in-for-a-score play was classic AJ. Despite missing nearly three games, he still ranks 9th in the MAC in receiving yards, and he’s averaging 18 yards per catch…K.J. Osborn is #2 in the MAC in catches, #4 in yards and #3 in TD catches. He’s averaging 17 yards per catch…Charlie Jones is averaging 25.1 yards per catch on his 11 grabs. That would lead the country, but Charlie doesn’t have enough receptions to qualify…Tyler Mabry had a career-high six catches against Toledo, as Tyree Jackson spread the ball around and found the open man…Jackson is now up to 20 touchdown passes this season. That’s tied for the MAC lead, and 10th in the NCAA. 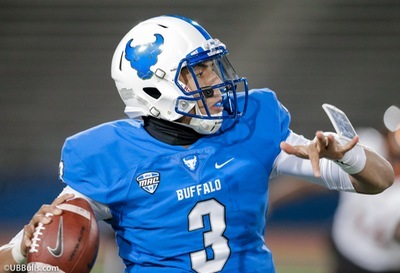 He’s nine away from the school record, and has moved up to fifth on the UB career list…Tyree needs only 176 yards to move into 5th on the all-time passing list…One of the few negatives about Tyree’s season popped up in Toledo. He threw another red zone interception, his 4th of the season inside the 20-yard line…Yes, it was Tyree who forced a fumble when he tackled a Toledo defender following one of his interceptions…In Jaret Patterson’s last three games, he’s averaging 100 yards. Patterson is averaging 5.3 yards per carry. Kevin Marks is 5.2…Center James O’Hagan will make his 45th consecutive start in Tuesday’s game…The Bulls have 11 touchdowns of 30 yards or more…The Redhawks are playing very good defense, despite a rash of injuries. They have two of the conference’s top players. LB Brad Koenig is 8th in tackles and 3rd in interceptions. He also has 3 sacks to go along with his 3 picks. Last week against Army, Koenig had 23 tackles. DT Doug Costin is the team’s second-leading tackler. He also has 4 sacks and 8.5 tackles for loss. Costin had 14 tackles against the Black Knights…Miami will be without starting DT Nate Trawick, LB Junior McMullen and CB Deondre Daniels. All are out for the season. Starting safeties DeAndre Montgomery and Josh Allen did not play against Army, and they’re questionable for this game…Backup safety Bart Baratti played part of the Army game with a broken bone in his arm because he knew the team didn’t have anyone to replace him…The Redhawks are tied with the Bulls for second in the MAC in sacks. Bullet Points: 0. That’s how many snaps the Bulls last two opponents have had inside the Bulls 20-yard line. Akron and Toledo never advanced into the red zone, with the Zips getting to the 27-yard line and the Rockets to the 21. Aapri Washington was the Bulls 6th cornerback during the offseason. Injuries opened the door for him to play, and he’s now locked into one of the starting spots. He has two interceptions in the last three games. Washington has been so good that Pro Football Focus, which grades college players too, said Washington has allowed the lowest passer rating when targeted of any cornerback in the nation…Leipold says fellow cornerback Devon Russell will miss the rest of the season with an injury. But he’ll be able to redshirt and return as a senior next year…Safety Brandon Williams has three interceptions in the last four games. His three picks are tied for 2nd in the MAC…The Bulls pass defense is allowing only 162 yards per game, that’s good for 11th in the country…In the last two games, the Bulls have allowed only 4 first downs on 26 third down attempts. They’ve allowed only two touchdowns in the last two games…The defense remains #1 in the MAC…Myles Nicholas will wear #41 for Tuesday’s game. He’s the hottest Bull on defense, with sacks in his last three games…Khalil Hodge’s next tackle will be his 100th of the season. That will make him the first Bull with three straight 100 tackle seasons. That next tackle will also move Hodge into 4th in UB history with 377…Miami QB Gus Ragland is one of the best in the MAC. He’s smart, steady, can run, can throw and rarely makes mistakes. He missed last year’s UB game, but threw two touchdowns against UB in 2016. Ragland is the MAC’s 4th leading passer and he’s 7th in total offense. In 15 games against MAC opponents, Ragland has thrown 33 TD with only 5 interceptions. He’s won 12 of those games…Even more impressive is Ragland’s red zone numbers. He’s thrown for 37 scores, run for 9 and thrown only 1 red zone pick…He’s played most of this season without his best receiver. All-MAC first teamer James Gardner was hurt earlier this year, and he’s out for the season…That’s forced the Redhawks offense to get creative. RB Kenny Young is second on the team with 29 catches. The tight ends have 18 grabs. The leading receiver is Jack Sorenson with 32. They are also using huge receiver Dominique Robinson, who’s six-foot-four and 240 pounds…Maurice Thomas, Miami’s fastest player, will sometimes line up as a receiver and catch passes. Sometimes he’ll line up as a receiver and run jet sweeps. Other times he’ll start from the backfield…The Redhawks have scored 30 points in five straight games…They lead the conference in red zone scoring, converting on 29 of 30 trips inside the 20, with 22 TD…Leading rusher Alonzo Smith missed last week’s game, and is questionable for Tuesday. That puts more load on Young, who ran for 125 yards against the Bulls last season…Miami has allowed only seven sacks all season. It’s referred to as “hidden yardage.” But it’s not hiding anymore for the Bulls. K.J. Osborn is averaging 10.8 yards per punt return, which ranks 2nd in the MAC & 22nd in the NCAA. It’s the most punt return yards by a Bulls player in eight years. Beyond the numbers, it’s what those yards have meant to field position and wins. At Toledo, Osborn’s 20 yard return in the third quarter set the Bulls up at the Rockets’ 32-yard line and led to Anthony Johnson’s game-tying score. Then, a 22 yard return to midfield started the game-clinching drive. Those 42 yards in returns were huge for field position and momentum. Along with crediting Osborn, Leipold says a new approach to practicing the punt return has paid off. The Bulls spent most of the offseason and preseason working on individual fundamentals of the unit. Bull Session Trivia Answer: Current Rams Head Coach Sean McVay and Ravens Head Coach John Harbaugh both played football at Miami. Please join me, color analyst Scott Wilson, game host Brad Riter and postgame host Bob Gaughan for the broadcast on the Bulls Football Network. Our pregame show starts at 7:00pm. You can hear it in Buffalo on ESPN 1520 and in Rochester on Fox Sports 1280. A link to the online broadcast is also available here and on the Tune In app.